Kaarel Ots, who took over as manager of Nasdaq Tallinn a week ago, said on Tuesday that it looked like things were finally beginning to move listing stocks and bonds of Estonian state-owned companies on the securities market. The Tallinn stock exchange saw a positive trading day on Friday as the OMXT index moved up 0.32 percent to 881.56 points and turnover from 100 transactions totalled 219,078 euros. The total turnover was quite small but most names saw trades carried out with their shares. Olympic and Kaubamaja moved up, while Tallink moved slightly downward. Merko Ehitus, which produced a very small turnover, moved up nearly 3 percent. Olympic Entertainment Group rose 1.13 percent to 1.79 euros as turnover from 32 trades was 70,546 euros. Tallinna Kaubamaja Grupp climbed 0.46 percent to 6.58 euros as 51,380 euros’ worth of shares changed hands in seven transactions. The price of the share of Tallink Grupp moved up 0.69 percent as 482,000 euros’ worth of shares in the shipper changed hands in a block trade in early trade on the Tallinn stock exchange on Monday. The three stocks seeing the biggest turnovers during the first 45 minutes were Tallink, Silvano Fashion Group and Tallinna Vesi, all of which posted gains. In the rest of the names turnover was smaller than 10,000 euros. With a turnover of 522,000 euros that included a block trade worth 482,000 euros, Tallink rose 0.69 percent to 0.725 euros. Tallink stands to receive 4.8 million euros to commission a new environmentally friendly LNG vessel costing 230 million euros to serve the Helsinki-Tallinn line starting from 2017. The investment under TWIN-PORT II is 16.0 million euros. Silvano Fashion Group rose 0.75 percent in early trade to 1.340 euros with a turnover of 20,000 euros and Tallinna Vesi firmed 0.76 percent to 13.20 euros in trade worth 16,000 euros. On Friday, OMXT inched up 0.03 percent to 840.43 points and turnover from 259 transactions totaled 535,651 euros. Tallink fell 2.31 percent to 0.72 euros and turnover from 114 trades totaled 241,613 euros while Tallinna Vesi rose 0.77 percent to 13.1 euros as 135,168 euros’ worth of shares changed hands in 38 transactions. The local Estonian securities markets are small in size and quiet in activity. The total capitalisation of bonds issued and stocks quoted on the exchange stood at 2.3 billion euros at the end of August 2014, or 12% of GDP. The small size of the market means that the risks to Estonian financial stability from the local securities markets are small. 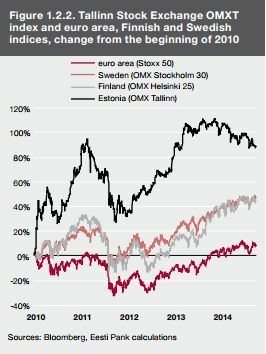 NASDAQ OMX Tallinn is on track for an all-time low volume, with turnover for the first three quarters of 2014 at 96.6 million euros, less than half of what it was in 2009. Experts say the decline in trading volume is a continuing trend caused by the lack of new companies entering the market and unwillingness of the investors to take risks. Alo Vallikivi, head of brokerage at LHV Investment Bank, said that there are more reasons for such low volumes. “Many still remember the 2008 decline in the stock exchange and those who got burned may never want to play the market again. A third and a global reason is that the decline in trading volumes is a worldwide trend,” he said. 2014 as an accommodation vessel. The period of the charter is at least 14 months with an option to extend up to 48 months. For Tallink, the deal means that M/S Baltic Queen which is operating on Tallinn-Stockholm route will change to Tallinn-Helsinki route on 7 August 2014 and M/S Romantika which is operating on Riga-Stockholm route will change to Tallinn-Stockholm route. M/S Isabelle will continue the service on Riga-Stockholm route. Out of the 13 companies listed on the Tallinn stock market, 10 are planning or have already announced dividends this year. The total will be 82 million euros, Postimeesreported today, with more companies than ever announcing a policy of dividends. Ekspress Grupp, owners of Delfi, and ferry operator Tallink began paying out dividends last year and are now joined by construction giant Nordecon, with Merko Ehitus (also construction), Tallinna Kaubamaja (store), Silvano GG (fashion), Harju Elekter (power), Olympic (casinos), Premia foods and Tallinna Vesi (waterworks) all expected to indulge shareholders.